Colin Pearce loves the ladies and the ladies love Colin Pearce right back. While the men’s shirts can be worn by women, this tank is specifically designed for women. The shirt is slightly tapered to show off a woman’s curves but modest enough to not give away too much. The color is a very hot pink. 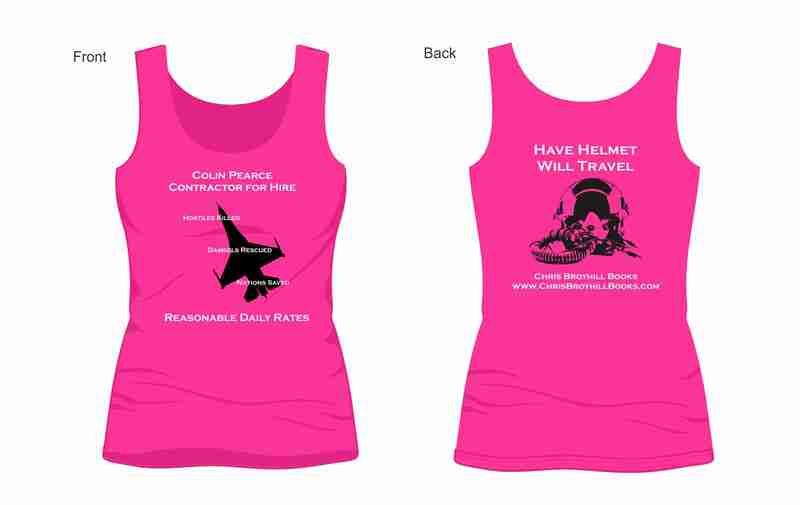 The front of the shirt includes the words “Colin Pearce Contractor for Hire” with the additional wording of “Reasonable Daily Rates.” The front includes a silhouette of a fighter jet and everything that Colin stands for including: Hostiles Killed, Damsels Rescued and Nations Saved. The back of the shirt includes a silhouette of a fighter jet helmet with the words “Have Helmet Will Travel.” The bottom of the back of the shirt includes the words “Chris Broyhill Books” and the official website address. Note: Every monitor is different and the shirt pictured here is a rendering. The actual tank color is a hot pink blue and may appear different in person than on your monitor.